Ishimaru Shotaro, an 89 year old tenkara angler in Japan, offered to give me some of his tenkara flies. He opened the box and out came an unexpected tenkara fly pattern. Why unexpected? For most of my fly-fishing life I had come to somewhat expect the look of a fly to improve in proportion with the time an angler had been tying it. 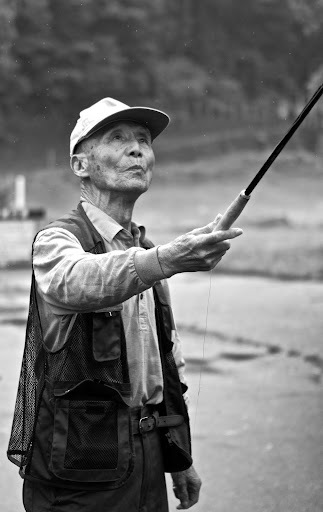 Mr. Shotaro has been tenkara fishing for over 77 years and is the longest practitioner of the method I have met. Yet, his flies were, for lack of a better term, the sloppiest I have ever seen. I mean absolutely no disrespect by the term sloppy here. Mr. Shotaro’s flies embody an experience that I can only hope to one day have. At a time when tenkara anglers were not interested in teaching their craft to others, he may be one of the first people in Japan to have learned tenkara and then taught it to other people. I should mention that he does and has caught plenty of fish on this pattern (though I’m not sure I can call it a “pattern” as none of his flies will ever, ever, look the same). On his heyday, before the damming of the rivers he fished and before most fish had been caught out of Japanese streams, Mr. Shotaro reportedly caught 130 fish in a day. Because of his frail legs, Mr. Shotaro no longer fishes. However, I did get a chance to fish with him for a brief period of time on the day we met. We walked over to the stream next to the Mazegawa Fishing Center, where I had been spending my time. I had fished that stretch of the river many times in previous weeks with very little success. After casting his “sloppy” fly to the water a few times, Mr. Shotaro managed to get two fish to chase his fly; and I can attest that was a good number for that water. Last week I posted the image above in our Facebook page and received a lot of comments about the fly. The people posting actually appreciated the fly. “Maybe there is genius in the “slop”?” said one poster. “Experienced tiers tie flies that fish think are foods…Buggy look is good!” and “commercial flies are tied to attract the customer. fish don’t have any money so they can only steal them”. The picture below, which I posted on my original blog post about Mr. Shotaro, shows his flies (left) next to some very beautiful looking flies. The pretty flies were tied by someone who had been tenkara fishing for only about 6 months. The dexterity and attention to detail in the nice-looking tenkara flies certainly betray the 76 1/2 year gap in their experience. What at first struck me as a sloppy tenkara fly has turned to be a representation of the pragmatic simplicity of the original tenkara angler. When he gave them to me, I thought, “now, that’s interesting…” and put them in my box. The flies he gave me have been tucked away for over a year when I just decided to pull them out for a photo shoot. Only once I stopped to look at the fly again and paid more attention, did I realize that their apparent lack of organization translates into a fly that I can not seem to replicate. Do I start at the front or the back? Do I wrap the hackle, wrap line over it and then wrap the hackle some more? This greatly intrigued me, if I couldn’t replicate that fly, maybe I just didn’t understand it. Mr. Shotaro’s sloppy fly gained a greater appreciation at this moment.The more I look at his tenkara flies the more they strike me as the work of an abstract artist with modern impressionist, or perhaps expressionist, tendencies. The most beautiful thing about Mr. Shotaro’s tenkara fly is that it is so widely open to interpretation. The disorganized look is neither methodical nor really sloppy. Perhaps one day their “sloppiness” will be more deeply appreciated, like a work of art. He certainly would never think of himself this way. But, when that day comes, Mr. Shotaro may come to be perceived as the Jackson Pollock of fly-tying. A few years ago I traveled to waters near a steam plant. In winter the steam plant makes for extremly good fishing. I went during the summer though for the day just to explore. There’s a bunch of fertile little islands all around the down river side of the plant. I saw many terrestrial and aquatic bugs floating down all day. Alot of the bugs were at the end of their time. They were very asymmetrical, IMO this is also a lure fish key into. Mr. Shotaro-san would be great to hang out with for some fish stories. I also often make my flies with a bit hanging out here or there, they seem to do quite well. With Mr. Shotaro’s flies, the delightful “chaos” forces me to pay attention to the fly. You almost don’t notice the hook. With the neatly tied flies, my attention is instantly drawn to the point of the hook. The second thing I see in Mr. Shotaro’s flies is that they seem to be tied head-down (with the hook emerging from the head), whereas with the other flies, it looks more like a thorax, with no real “head” to strike. Part of it might be the proportion created from where the hackle “wings” emerge from the body. This is by no means a criticism of the “other” flies, because I’m sure they catch their fair share of fish. But at least for me, it is interesting to see how in this case, the hackle is not the only thing that’s reversed, and how effective the “chaos” is at drawing attention away from the sting – at least in my eyes. If I start from the head, my eyes are drawn up towards the “tail” – I never really notice the hook. If my eyes are drawn to the end of the thorax, it naturally follows the line towards the hook. But again, maybe that’s a just human behavior, and less of a fish thing. Or maybe I’m just over-rationalizing. Sorry — guess that last post wasn’t entirely clear. “If I start from the head” refers to Mr. Shotaro’s fly. “If my eyes are drawn (down) to the end of the thorax” refers to the neatly tied fly. Mr. Shotaro’s flies look really buggy to me and what helps is the way his flies are covered more with thread deeper into the hook. Seems to me he wraps thread a little deeper into the hook and that might help take the hook part away from your eyes and points it more towards the body. At least for me that is what I see first. This fly would seem to be the ultimate in an impressionstic tie, but all the “elements” seem to be there: black head, grizzly hackle suggesting wings and legs, and red tag. Good to see that Japanese tenkara flies go beyond just reverse hackle flies. If I were a trout, I’d pounce on that! Fly tying is definitely an art and every person puts their own unique twist on it. Aha! I have been doing something right all along with my tying! Beautiful. I have long appreciated the Wabi-sabi style and Mr. Shotaro’s flies embody this. The same can be said of tenkara. Dunno..they look more like insects than the traditional kebari. Then again, since he catches fish, isn’t presentation supposed to be the ruling factor?